Replies: 29 (Who? ), Viewed: 8494 times. I have converted a coffee table from S2 to S3. In S2 it had only 1 texture for the entire table. When I converted it I wanted to have 2 channels for textures. I got everything working fine. The table had 4 default pattern combinations. When I first put it in the game I could start with any of the 4 presets. I could change either texture to anything I wanted, I could change between the 4 presets. It worked perfectly. After closing the game and going back in it continued to work just the way it was supposed to work. I had put out all 4 presets side by side in anticipation of taking pictures to upload the object here. This was last night, today when I open the game each table still appeared with the 2 different textures as I had left them. But if I even touched one with the create-a-style tool it snapped to only having the second channel texture all over. I quit the game, deleted my cache files and started again. When I reentered the lot where the tables were, each appeared to only have the second channel texture. If I click on a table with the create-a-style tool both textures show in the pop up window. But only the second is on the table. I can drag the texture bar to another object and both textures from the table will transfer to the other object. I can change either texture, but only changing the second one does anything. And then it changes the entire table to that texture. I tried to reopen the package in TSR Workshop (the tool I used to change the default textures from the object I cloned to what I wanted and fixing the ground shadows) and it will not appear in the window and I get an error when it opens. See attached screen shot. Any help will be much appreciated. Keep answers simple. This is my first ever object and my eyes are still bleeding from reading many tutorials. Not positive but it looks like something in the package was deleted or corrupted. If you are importing this back in from package I think it is renumbering your package, so if your trying to import new textures or something you may have corrupted it. Not positive though on that. In TSRW you can save your project as a wso (?) type if you anticipate having to go back and edit it, and I would have to say this is probably the preferred method. What I would do is export the meshes as wso, keep a copy of your textures, and start over. Might be quicker. If it were just the channels that were behaving oddly and the number of presets then I would say look at your textures to make sure they have the right channels and whether the channels are still set to enabled for each preset in TSRW. Well, I've never had TSRW on my machine so I'm not sure but I thought I had read that once an object is made with TSRW it cannot be edited. HL posted around here in meshing someplace about this issue and how she gets around it when using TSRW. I would hunt down her post on this and see if there's anything you can do to edit the object you've got or if you'll have to re-do it. Also, you're saying the object worked. Then you closed the game and restarted and it still worked. You closed the game again. And then the third time you reopened the game it no longer worked? I'm guessing you didn't do anything to the object in the meantime (especially since TSRW wouldn't let you anyway). Is this right? Which S3 object did you use as your clone and how many recolorable channels does it have? And have you tried asking about this at the TSRW forum? Maybe they have some experience with this problem that isn't widely known over here since most people here seem to use the tool-set from Peter, Inge, and Wes. ETA again: What I mean was did you attempt to change the object at all between the second and third openings of the game. HL, it sounds like what you're saying is that you can't even alter a dds IMG once you've made the final simpack or whatever it is they call it over there. Is that right?...I mean we aren't talking about .packages here are we...these are simpacks? My only thought on changing the images is comparative to s3oc. If you clone, export, change stuff, then you fix the object package you just changed all the instance numbers and you can't simply reimport the same files since it won't replace them it will add them to the package. No idea if/how TSRW handles this, I've only made changes objects with a save file. TSRW allows you to import package files, and it is those that I believe it renumbers. But you made me think of something else, are these files being exported as sims3packs or packages? And are you exporting them directly to your mods/packages folder? And having them open in TSRW while your trying to run the game? To begin this project I followed Jonsie's tutorial at Black Pearl Sims. The only exception to that is that the S2 mesh did not take well to different textures. Detailed patterns looked very distorted, so I simply created a duplicate of the mesh in Milkshape. 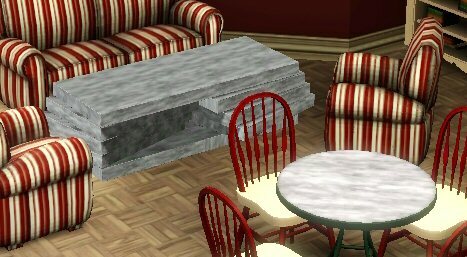 The table I am converting is the ScienStone Dramatic Coffee Table from the Sims 2 base game. It's just 8 boxes really, so it was fairly easy to make my own using the EA mesh as a guide. But in S2 it only used pretty much solid colors for textures. Anyway I did everything in S3oc, S3pe, Wes Howe's S3 Object Tool, Milkshape and UV Mapper Pro to get a start. But the textures remained from the S3 table I cloned. (The 2x1 Mission Coffee table.) And the shadows were messed up. Jonsie did not go into shadows in the tutorial because he created a blanket and did not want a shadow. I tried to search every where for ways to change the default textures and could only come up with TSRW. And it also made fixing shadows a breeze. Also on a side note I did save the project as a .wrk file with TSRW. I get the same error when I try to open it as I did with the package. So after getting the initial package I opened it with TSRW (no error) and fixed the shadows and changed the textures. I did make sure they were enabled as I had read that it was needed to make them work. As I said when I was to this point I put the package in the game and it worked perfectly. When I reopened the game it worked perfectly. The next day I reopened the game to take pictures and when I went to change a table to solid red and green to show the channels I discovered the problem. I have done nothing with this package other than attempt to open it with TSRW. I did not have the package opened in TSRW when I ran the game. Either with or without the problem. And we are talking package files not Sims3packs. When I made the changes to the original package (in a folder on my desktop) I saved the TSRW package directly to the proper game folder. Tonight to further investigate the problem I put the original package in the game to see how it worked. It still has the default textures of the Mission Coffee table and the messed up shadow. When I place the first table in the catalog it looks fine until I place it and then both channels look like shiny chrome. It was not like this the first time I put it in the game and saw the messed up shadow. I can change both textures and fix it though. The other 3 choices in the catalog work fine. I also found now that if I try to place the 4th pattern choice of the post TSRW package it too looks like shiny chrome, the other 3 just have the single texture from the second channel. And one more thing to add to the confusion I added the texture that was not showing and should have been to the texture catalog and can place it back on the table and it worked. After doing this I can also now change the first channel of all the post TSRW tables. Not just the one that used the texture I added to the catalog, but all 4 of them. I could not do this immediately after discovering the problem. Again I have done nothing to change the package since I first placed it in the game. And finally when I open the packages with S3PE the post TSRW package does not have anything listed under the names column. The original package does though. PS: If there is a better way than TSRW to change the textures and fix the shadows I would appreciate it if you could point me in the right direction. I do not know how to change the textures in S3pe. I actually only used it to open the package and get the image, MLOD and MODL files. I have much to learn! Last edited by GiveTheNineARide : 26th May 2010 at 11:14 AM. Lol HL...I'm using my emergency backup keyboard and it's clunky...but my good one had a run-in with coffee, its keys stick, and I've yet to replace it. GT9...shwew...I'll admit I'm a little confused by the sequence of events that you're describing here. First off though, that tutorial by Jonesi, while a nice start at the time, is outdated, written for past versions of the tools, and contains some inaccuracies and omissions. Just off the top of my head, after a brief look through it, I can tell you that she glosses over joints as if you don't need to assign them (untrue) and changes the size of the dds image files without changing the corresponding mtlsrc mask width/height which will give you a distorted pattern in-game (which if you look at the picture at the end you can see the pattern is, indeed, distorted) I'm sure there's more...everyone was still learning the fine details of how to mesh S3 when she wrote that. The mapping step is not fully fleshed out so it's difficult to know what method you used for your mapping. If this is your first Sims 3 project I would recommend starting with EllaCharm's tutorial that is in the meshing tutorials section here and following it step by step using the clone/project she uses. Meshing for S3 is difficult enough to learn without starting on converting an S2 object and using multiple tool sets to do so. There's so much that could have gone wrong in the sequence of steps you're detailing that I don't even know where to start looking for the problem. Once you've mastered Ella's tutorial using a single tool-set and making a simple clone (rather than a conversion which is more difficult for a lot of people) then move on to this project. That's my advice. As far as things looking different when you open them a second time in the game goes...I can't imagine how that would happen unless it's a caching issue or you altered the .package file in between opening the object once and opening it again. I know you say you didn't but is it possible that you might have inadvertantly saved over one version while thinking you were working with another? The shiny chrome issue sounds like a Specular problem. Altering the shadow is a matter of altering that little flat plane that appears as group00 when you open the only MLOD with two groups. Both of these issues are discussed in the Tips and Tricks thread I wrote in the meshing section and I think they are also both discussed in the meshing section of the S3 Wiki. Take a look at both of those resources because they contain information that will help you. I've noticed that TSRW strips the names off of things when I've opened things made with it by other people in my s3pe. It appears that it is normal for it to do that. There is a tutorial in the meshing tutorials section here on how to change the default textures using s3pe. But this is more advanced meshing and, again, I would recommend you try something basic just to get the steps down before moving onto something like that. Right now, you've got so many steps involved with the object you made and a mistake could have been made at many points or even multiple points along the way. It could be some basic meshing error, it could be some interaction between the two tool sets you used, it could be some TSRW quirk I know nothing about, it could be...and etc. I'm not saying all that to be snarky...I really do think this is the best way to go about things. Opinions on that may differ of course. HL, can TSRW apply the fourth channel to something that had only 1 or 2 to start? Just curious about that. which will work on other object too...not only paintings. Last edited by orangemittens : 26th May 2010 at 12:55 PM. Based on what your doing, you could just use TSRW for the entire process. And it is much easier to export/import meshes in TSRW, I do wish S3PE could import the objTool and decompiling like TSRW did. Your not trying to do anything advanced with your package so TSRW might be the easiest and quickest for you. Cloning in S3OC and then switching to TSRW should not cause a problem by itself, I've done it with no issue. So take your saved .wrk, the one that has the mission textures and messed up shadow. 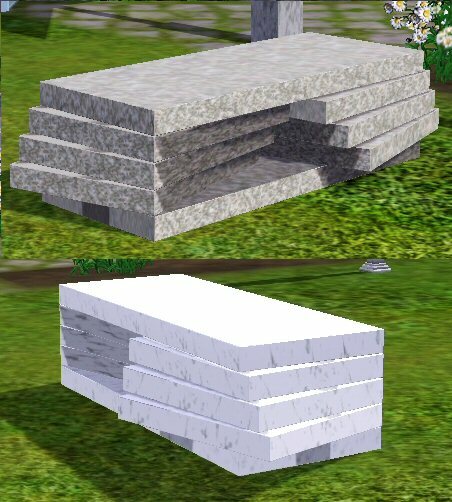 Correct the shadow, double check your textures and make sure the alphas are the proper color,Tutorials:TS3_Meshing_FAQ#Textureswiki then import into TSRW. If this looks all good there save it as a different wrk filename, export to package, clear your game caches and test. If that doesn't work right you can attach the newly named wrk file here and I will take a look at it if you want. From what I can see TSRW cannot add that fourth channel/pattern. It lists three and you can enable/disable those, but it won't add the fourth. GT9...shwew...I'll admit I'm a little confused by the sequence of events that you're describing here. First off though, that tutorial by Jonesi, while a nice start at the time, is outdated, written for past versions of the tools, and contains some inaccuracies and omissions. I did not know that the tutorial was outdated, but just sketchy in places. In learning how to do this I did learn about joints and the need to assign them. I did so with this object after I had exchanged the meshes. I learned much more about textures reading the tutorial by CycloneSue at TSR. The images I used were of the same dimension as the cloned object. I have to go back and check about the Specular, but I know that the Masks and Multipliers were all 512x512. The Mask is just split red and green, top and bottom respectively. The Multiplier is just a solid gray-scale as there was no details in the ScienStone coffee table I was converting. I'm sure there's more...everyone was still learning the fine details of how to mesh S3 when she wrote that. The mapping step is not fully fleshed out so it's difficult to know what method you used for your mapping. I had done some texture mapping in S2 before (doing recolors of some of HL's stairs)and feel comfortable doing so in UVMapper. Admittedly there are many steps to doing a conversion, but I felt I had followed what I learned pretty well and have to say though that there is a good chance of messing up something. I will take a look at Ella's tutorial, thanks for the advice. As I said in my original post after the problem arose the first thing I did was delete the cache files. That only changed the problem from only having the second channel texture all over when touched with the create-a-style tool to having only the second channel texture as soon as I opened the game. And although I'm new to making objects I am quite adept with working with files on a computer and am able to keep things very organized. I'm sure I did not copy over something that I did not want to. The shiny chrome issue sounds like a Specular problem. That's another reason to go back and check the dimensions of the Specular, but if I remember correctly the size of the Specular isn't that important, like the Mask and Multiplier. I could be wrong though. I do know that the Specular of the object I cloned was smaller than the Mask or Multiplier. Altering the shadow is a matter of altering that little flat plane that appears as group00 when you open the only MLOD with two groups. Both of these issues are discussed in the Tips and Tricks thread I wrote in the meshing section and I think they are also both discussed in the meshing section of the S3 Wiki. Take a look at both of those resources because they contain information that will help you. I will take a look at those also, thanks. I did remap the groundshadow from the S2 object using UVMapper and that weird looking image with the blobs from S3 . The shadow looked fine indoors, when I placed the new table outside the Sun shadow actually showed under the table accurately, but also appeared on the top of the table. That was the only thing about the shadow that was messed up. I really want to find a way to assign textures differently that using TSRW. So I will definitely take a look at that tutorial. I don't know how I missed that with all the searching I did. EDIT: I think in looking at this tutorial I will be able to salvage this project by getting the shadow problem worked out by regrouping the top separate from the bottom and using the tutorial's method for changing the default textures. I guess I will need to get the shiny chrome problem worked out also, but I will keep working on it. I don't take it that way. I am humbly trying to learn. I'm the type to jump in with both feet though and sometimes do get in over my head by doing so. Based on what your doing, you could just use TSRW for the entire process. And it is much easier to export/import meshes in TSRW, I do wish S3PE could import the objTool and decompiling like TSRW did. Maybe I missed something, but I do not see a way to import meshes in TSRW. All I have been able to do is start a project and open an existing S3 package. So take your saved .wrk, the one that has the mission textures and messed up shadow. Correct the shadow, double check your textures and make sure the alphas are the proper color,Tutorials:TS3_Meshing_FAQ#Textureswiki then import into TSRW. If this looks all good there save it as a different wrk filename, export to package, clear your game caches and test. If that doesn't work right you can attach the newly named wrk file here and I will take a look at it if you want. I will take a look at that. I have to say that I appreciate all the work people put into all these tutorials and such. But I also have to say that to read them all and stick with this takes a lot of determination. But I have committed myself to learning this stuff. The only image that has an alpha is the Specular and the alpha for that is solid black with a small white dot in one unused corner. I learned to do that so Photoshop doesn't drop the alpha because it is all black. The Mask and Multiplier images only have the RGB channels. I believe this is right, isn't it? Last edited by GiveTheNineARide : 29th May 2010 at 10:39 AM. HL, I'm curious about the sunshadow issue GT9 is having using TSRW...as far as I can tell, about the only real benefit of using it is having that sunshadow constructed for you since it really can be a pain at times. But GT9 is saying his sunshadow is appearing below the object and above it...do you have any thoughts on why the tool is making that happen? I'm just curious about it. Also, do you think it's possible that the 4th channel issue is part of the problem here? GT9 mentioned having tried to apply a fourth channel but the endtable does not have 4 originally to the best of my knowledge. I know the tool set here can't put a fourth channel on yet and, it's sounding from what you say, that TSRW isn't able to apply a fourth channel to an object that doesn't have one. GT9, it *does* take a lot of determination. Again, I think you'd be best served by picking one tool or the other and starting out with a basic tutorial for that tool instead of trying a sort of more difficult project and mixing tools sets to create it. If you try the tutorials here for this tool set and run into problems lots of people will help. I can only guess the same is true if you pick TSRW. Also, the size of your Spec isn't what causes the shiny. The shiny comes when the Spec isn't pure black. If I were you I would double check to make sure you've got the right thing there because that Spec can be sneaky. Hmmm...I just read the bit about the texture mapping that you wrote. Making recolors doesn't require texture mapping. It requires you to match your new image to a map that is already there. So this part about what you wrote makes me confused. Lol...and now I've just read your edit about the sunshadow. So strike that question HL. It would appear that TSRW's sunshadow constructer works similarly to baking something. If things aren't supposed to have the same shadow they can't be in the same place on the map. A little inconvenient but workable. And that makes me wonder about the whole method the game is using for the sunshadow and why, if I bake something correctly, the sunshadow I make still sometimes doesn't work out right. It's most annoying. Last edited by orangemittens : 27th May 2010 at 1:05 AM. TSRW did not cause the Sun shadow problem it cured it. I caused it by grouping the top and bottom in Milkshape before mapping. I am a little confused about how it cured the problem considering the top and bottom were mapped together. I don't think I mentioned attempting to apply a 4th channel. And I know I did not try to do so. If you thought I did from somthing I wrote. I'm sorry. And I am not even sure how I would do that if I wanted. I have tried to this point cloning objects that already have the right number of channels that I want. I think at this point I am going to steer away from TSRW and stick to the other tools even though they are more complex, they probably also add more ability when used. I am going to go through these tutorials one at a time until I really understand what I am doing and not just following the steps. After which I will go back to this screwed up project and fix it. I'm about to begin Ella's tutorial. We'll see how it goes. Do you mean the Alpha channel needs to be pure black? The whole thing doesn't need to be does it? <-Unanswered Question As I understand it the amount of color (in equal proportions) determines how shiny the object is. With a pure white Alpha channel causing an extremely shiny object. As mentioned I did put one speck of white in an unused corner of the Alpha channel because I had read (I think in CycloneSue's turorial) that if the Alpha channel is pure black Photoshop could drop the Alpha channel thinking it's not needed. For this object I set the red, green and blue channels to 210 each and the Alpha to pure black. The object when it was working correctly had just the right amount of shine that I wanted. I also understand that if you want a part of an object to have more shine than the rest you make a portion of the Alpha channel lighter (lighter = shinier) and map that part of the object to that area. I am pretty new to all this so if I say that understand things to be a certain way and I'm wrong, please tell me so. I really am trying to understand how all this works. Sorry I confused you. I should have just said that doing the recolors helped me greatly to understand how mapping works. I don't think I have any problem with mapping, as this object looked great before the problems started. Very detailed and everything just where I wanted it. I also just read a post at TSR that led me to believe that this entire problem could be with TSRW not being compatible with all objects in S3. Again, just so you understand TSRW fixed the problem with the Sun shadow that I caused by the grouping I did. I want to thank you again for all your fantastic help. Last edited by GiveTheNineARide : 29th May 2010 at 10:42 AM. Hmm..I'm still unclear about the sunshadow thing. As I understand it TSRW has some magic sunshadow maker that should be making your object's sunshadow just right...and it didn't do that...it made it on top and bottom...which is what you said. So either I'm misunderstanding you or you aren't explaining the sequence of what you experienced or something...lol...it doesn't matter. I'm not gonna use that tool anyhow...I just get curious about anything having to do with sunshadows in S3 and I apologize for that. You said this up above, " I also found now that if I try to place the 4th pattern choice of the post TSRW package it too looks like shiny chrome, the other 3 just have the single texture from the second channel..." which I'm not really certain what you were discussing if you weren't discussing the fourth channel. There is no fourth pattern choice without a fourth channel I don't think. I think going through the tutorials will be a very good idea...if only to get hold of terminology and steps because, quite honestly and meaning no disrespect, it is very difficult to understand what you're talking about much of the time. Go through a tutorial one step at a time and try your object in-game after each major change you make. This way you can pin-point any problems you have and you will know which step it was that caused it. Then people can help you. But if you come here with an object after 100 steps made with multiple tools the task becomes almost impossible IMO. Also, if you could link to the post you mentioned at TSR that would be great...I'm very interested to read that. Actually in my case the only obvious thing it did was remove the shadow from the top of the table as it already was correct besides that. I still am at a loss as to how it did this considering I had the top and bottom grouped together for mapping?!? When you click on an object in the buy catalog a number of thumbnails appear each with a different combination of textures. The Mission Coffee Table already had four default combinations of textures to choose from when you were in the buy catalog. This is what I meant by pattern choice, not a 4th channel on a single object. The table I was trying to make had 2 channels. I maybe did use the wrong term here that confused you. I can tell you that with TSRW it is possible to add or delete these choices. Anyway, I wasn't talking about a 4th channel, rather a 4th default combination of textures in the buy catalog. Sorry for the confusion. I think going through the tutorials will be a very good idea...if only to get hold of terminology and steps because, quite honestly and meaning no disrespect, it is very difficult to understand what you're talking about much of the time. No disrespect taken, but please understand that myself and I'm sure others feel the same way when reading tutorials. It seems like it is assumed that we know what they are talking about, and at times I for one am without a clue. Sending me off in another direction to find out what they are talking about. A brief explanation at least would be very helpful. The people who write tutorials are trying to be clear. I am trying the same thing here because, just like them, I want to be understood. My point here is that the gap of understanding works both ways. Go through a tutorial one step at a time and try your object in-game after each major change you make. This way you can pin-point any problems you have and you will know which step it was that caused it. Then people can help you. But if you come here with an object after 100 steps made with multiple tools the task becomes almost impossible IMO. When I first posted here the only step and tool I thought caused the problem was changing the default textures in TSRW. I had put the original package in the game to check it out. It had the textures that I expected it to have from the mission coffee table. And the issues with only the second texture showing on the whole thing did not exist. And still doesn't with that original (pre-TSRW) package. The only problem I have with that package is the shiny chrome thing which I still haven't figured out. The shiny chrome problem did not exist with that package when I first put it in the game to check it out, but surfaced later when further investigating the texture problems. The problem with having only the second texture all over did not show up until I changed the default textures in TSRW. So I was not trying to have someone figure out the problem caused by multiple steps. I probably should have posted at TSR but I find the people here more friendly and helpful, as you have demonstrated, and I figured that quite a few people had experience with TSRW here at MTS, also. I tried to find the post with no success. Even my browser history isn't of much help. It's very cluttered with results from recent searches and pages that I have found trying to figure out the problems I'm having. You have been very helpful to me though, so I will try to find it again tomorrow and will post the link here if I do find it. Last edited by GiveTheNineARide : 27th May 2010 at 6:26 AM. Well, I'm not sure how I've been helpful but it's nice of you to say so. And I do understand what you're saying about not knowing what people are talking about when learning to mesh for this game...I'm sure I tried the patience of at least a few people while I was trying to get it...prolly still do as I try to learn more. Tutorials are good because at least then usually you get pictures and that's a big help. Anyway, if we're now back to the pre-TSRW object (the one that's fine except being too shiny) and it's still having the shine issue...did you check the spec? I know you said you made it all black with a little white dot...but those specs can get funny. I've changed them only to have them show up all white when someone else checked them for me. I use Paint.NET to make them now and that has always worked. I have attached the package files in a rar to this post. Hopefully you can look at them and see for yourself the problems I am trying to describe. Maybe that can help clear up any communication problems we seem to have. The package named GiveTheNineARide_ScienStone_Dramatic_Coffee_Table is the pre-TSRW package and the other named just ScienStone_Dramatic_Coffee_Table is the post TSRW package. Your ScienStone_Dramatic_Coffee_Table (the post TSRW package) does not have any textures (_IMG) in it when I opened it in S3PE. So somehow your new package must be referencing some game textures, not the new textures you've made for it? Good catch! For some reason when I open a package in S3PE the tag column is hidden unless I move things over to look at it. I had not done that with this file. Probably should have though. After reading your post I opened both packages in S3pe. Other odd things that are different. The post TSRW package has 23 STBLs the pre TSRW package only 3. Post TSRW package has only 1 XML the pre TSRW package has 5. The only difference between these packages as far as what has been done to them is I opened the GiveTheNineARide_ScienStone_Dramatic_Coffee_Table package in TSRW and changed the sunshadow and the default textures. Then exported it as ScienStone_Dramatic_Coffee_Table. Seems TSRW decided to change a few other things. I guess I really can't understand then how when I first put the post TSRW package in the game it worked properly. As much as that program seemed to make things easy to do, I'm really disliking it now. Again thanks for the heads-up. I'm in the process of learning how to do things without TSRW and that sounds like a good thing now! I was interested in your problem, and made that coffeetable in TSRW too. I'm doing a lot of TS2-TS3conversions lately, but only for my own game for now. I find TSRW very usefull for this conversion work, because you can see the results of your changes immideately. Apart from the meshing, changing the textures is very important in conversions. The amount of changes/work you have to do with TSRW and using the tools from here (MTS) is the same, and reading/learning all our tutorials will certainly help you in understanding the process. Anyway here is the result of my coffeetable: picture1 is the first test where the textures are to bright, in picture2 I have overdone darkening the Multi and Specular textures. I've attached the package and the .wrk file in case you want to see what is different in mine. I have no intend to finish this table myself, so I did not make a decent Low lod. The other one...the pre-TSRW has all its IMG files but the Specular dds is a 128 x 128 square that has a very pale gray alpha when I look at it in PSP. The paleness of the alpha on the specular is what's causing this object to take on that chrome-like appearance most likely. Change that to black and you should get a much better look. ETA: If you look in the mtlsrc's for the MLOD1 (the one with a shadow plane) you can see that the shininess setting on the phong slider is 22. Most EA items except for ones they wanted to be glossy have a shininess setting around 20 I think. 23 is the highest I've seen so 22 is gettin a little on the shiny side...probably because of that very pale grey specular alpha from what Inge has said about this issue in the past. Also, I'm not sure if this is your problem seeing the tags column in s3pe, but if you shrink the S3PE view box some columns cannot be seen unless you look for them. But if you expand it width-wise all the columns should show. Last edited by orangemittens : 27th May 2010 at 2:35 PM. I may not have followed everything listed. But I want to clarify a few things, terminology wise, which seems to be causing some communication failures. *The mission coffee table has 2 channels, this are your two recolorable areas in game. It gives you two little boxes in CAST. This also is defined by your mask, the red/green img file. *The mission coffee table has 4 presets. This is the number of preset color combinations available. *Photoshop does eat alphas when they are pure black. You can put a small amount of white on it in PS to an unmapped area, but only necessary if you think you will be bringing that alpha back into PS. Adding a pure black alpha is easily done though so I never bother. Click Channels/New. If the alpha is not pure black on the specular then it will give it a milky shine. And that mission coffee table has a 128 specular compared to the 512 multiplier. No idea why. LoL Unless I missed something there isn't any reason to adjust the mtlscr files. And on sun shadows, I think that TSRW is using a formula to calculate size and offset from the main mesh. Most sunshadows are roughly 1.5-2 times the size and offset by something else I don't know off the top of my head. Haven't made anything with a proper sunshadow in quite a while, these days I ignore them. If your using an object made from TSRW you will not have names for the resources, it eats them and does not provide the key resource. Stupid I say. Thank you for your interest. I will download the file to check it out. I exported the S2 mesh using SimPE and do not understand how to get the .obj file into TSRW. As I stated earlier all I have been able to do with that tool is start a new project and open an S3 package that I have exported with S3oc. So while I understand how to get the S3 part into that tool, I have no idea how to get the S2 part into TSRW to do the conversion. The other problem I have I guess is why did my using TSRW on an almost working conversion make such a mess of that package? And based on my discussions with OM at this point I need to concentrate on one set of tools or the other for now. Since you have had such great success using TSRW, I'm almost tempted to go that route. But I'm hesitant because of what a mess I made of this project using it. I'm stumped as to what direction to take here. I have worked with Paint Shop Pro for years and feel most comfortable using it for image editing. The problem I am having though is that I cannot for the life of me get the DDS plugin for PSP to work. A while back when I did the recolors of HL's stairs I had it working, but have since changed computers and operating systems. The PSP version I have is PSP 8. If you could offer any suggestions as to how to get it to work I'm all ears. I have gotten the DDS plugin to work in Photoshop. The same plugin is used for each program from what I understand, but given that I cannot get it to work in PSP. as I try to learn about object creation, I am also trying to learn my way around Photoshop. I have installed GIMP and gotten the DDS plugin to work with that, but have already come to the same conclusion about image editors as we have arrived at here with object creation; I need to pick a route and stick with it. Also as far GIMP goes when trying to find out the problems I have with this project I opened the image files in GIMP but can't even figure out how to view the Alpha channel. So with all this in mind you can understand that the only thing I can do at this point is look at the Alpha channel in Photoshop. And in Photoshop the Alpha appears to be pure black and the RGB channels appear to be a pale gray. You say to change it to black. How do I do that if the only program I have that I am able to see and work with the image shows me that the Alpha channel is already black? This is one of those places where, like I said earlier, I haven't a clue what you are talking about here. You may as well have written that in Latin from my perspective. No disrespect intended. I am using a monitor with a resolution of 1920x1028 and am opening S3PE full screen, hence there is plenty of room for the tag column to show. It has never shown as long as I have had it installed on this machine. This was in the past a stumbling block for me when I read in tutorials about looking at information in the tag column when none appeared on my screen. That is until I figured out that it was merely hidden. But as I said there is plenty of room for it, it just doesn't show for me by default. If it did this thread probably wouldn't exist. When I look at the Specular in Photoshop the Alpha channel is pure black. I don't understand all of this either, but that is the same conclusion I have come to about this. I haven't a clue about most of what you wrote here, other than you don't bother with sunshadows lately. OM said the same thing earlier in this thread about the names. I'm technically challenged by most of this but would agree that this is a major fault with TSRW. Last edited by GiveTheNineARide : 27th May 2010 at 5:36 PM. Well, I must say you have all about the same tools/equipment I am using, so if you do want to use TSRW, I can give you some more information about it. I need some time to collect links info and pictures, but I can write it down for you real quick. Let me know if you want it, because I really hate to do unnessecairy work. I do not know everything, but I can share what I do know. I do have a working DDS plugin for PSP8, but since I can burrow Photoshop3 I prefer to work with that if I can. The actual mesh conversion from TS2 to TS3 mesh is done in Milkshape, not in TSRW. You export the TS3 High- and Low lod meshes from TSRW, and the TS2 mesh with SimPE to GMDC by rightclicking on it, import the TS3 meshes with the TSRW/WSO plugin and the TS2 mesh with the Unimesh plugin, and convert them in Milkshape to High and Lowlod. Than you import those bach into TSRW and adjust the textures footprint etc and make the sunshadows. TSRW does make OK sunshadows for you, only sunshadows usually can contain even less polygons if you make them yourselve. TSRW makes them count the same as the High and LowLod meshes. In Ellacharms tutorial you will find very valuable information about working with our tools like S3OC and S3PE and the objecttools. It also tells you how to show the tags etc in S3pe. Reading and doing the tutorials will help you understand what has to be done to make an object just the way you want, TSRW can help you changing things quick in a visual way. Last edited by Cocomama : 27th May 2010 at 6:09 PM. I am certainly interested in learning more about TSRW, so I can make an informed decision which route to take from here, thank you. I am also interested in the plugin for PSP since I already know my way around in there and if I don't have to learn how to do things in a different image editor it will make object creation much easier. I'm a little cloudy here on how to import the meshes back into TSRW. As I have said I have only to this point opened S3 packages with that tool. When I've made your coffeetable with TSRW, I have made some step pictures from it. I think you can use them, read the titles from the pictures in sequence like you would read a strip/comic book, or however you call it. I have zipped and attached them and also my workfolder with the meshes and textures. Create a folder called PlugIns under C:\Program Files\Jasc Software Inc\Paint Shop Pro 8. Unzip/pack the downloaded DDS plugin and copy/cut and paste the DDS Plug-in into the new PlugIns folder. And here is some info about working with channels in PSP8. I have no idea where I found that anymore. In the Patterns forum and on the Wiki is a pattern tutorial that works with PSP, maybe I found it there. In either way you sure will find more info there about working with PSP. Define your channel sources. This puts the channels again into one image. You do know you have to copy paste the plugins from TSRW into the Milkshape program files, to be able to import/export the High and Lowlod meshes? OK. I have gathered some more links for you. I hope the moderators will not be angry about the double post, but it is so much. I have used • TSRW_RC4_v2.exe, there is a newer version if you want, but I have not tryed that one yet. Not only usefull for TSRW users, explains all the formats and making of textures. I use the method with exporting the GMDC and LIFO, includes link to Unimesh plugin from WesHowe. There are several 'doors' to export/import the data from TSRW and work with other programs such as S3PE. Attention, New Import is currently buggy as it deletes the textures in the project. This needs to be fixed. Just import them again if you choose to use this. I hope this will help you to complete your object, the TSRW is a nice addition to our growing toolkit. Please do not forget to give your eyes some rest now and then, you do not have to learn everything today. ...Haven't made anything with a proper sunshadow in quite a while, these days I ignore them. I wasn't suggesting that the mtlsrc files needed adjusted for size. And I also said above that the size of the spec wasn't an issue. What I was trying to say, apparently not coherently, is that the shininess on the *phong slider* is set to 22 on this object which is well above the shininess setting on an average EA item. Inge had said before that this number influences the specular...in Dee's thread from a month or so ago...and that altering the spec or altering that number can both achieve the same goal...modifying shininess on the object. That's what I was *trying* to say...lol...I apologize if it didn't come out clearly the first time. Thank you for clarifying the words presets and channels...I think there's been some misuse of the word channels when the term that was wanted was presets. GT9, with all due respect, you don't read the answers you are given and that is half the trouble in this thread so far. HL told you in post 2 your object might be missing something but you didn't look...if you had you would have noticed you were missing your IMG's on the TSRW version. I told you above, multiple times, the specular can be trouble and now you're asking me to tell you how to get PSP to do make them. Read the answers you're given. I also told you above I use Paint.NET to make alphas, *not* PSP and it works like a charm. If you need a link to get information on that I'll post one. But please...do try to read the answers you're given and base new questions on those answers. Don't race through them...read carefully and follow the advice you're given. Otherwise there is no point in asking questions and no point in having other people answer them. Again, my advice to you is to pick a tool set and follow the basic tutorial...*to the letter*. Don't race on, don't ignore instructions, and don't think you're gonna fly through stuff without actually reading and comprehending it. This isn't easy, it all takes a lot of steps, the steps have to be done precisely, and it isn't for people who can't or won't read the fine print. And I do say that in a spirit of goodwill. Focusing on the details of how things are done and the advice people are giving you is the only way you're gonna be able to learn to mesh for this game.